The prolific Catalan artist this time gives us airs from Marais’ Alcione, part 2 of the Galicia project, and the second collection dedicated to Montserrat Figueras. I. La Lira d’Ésperia II (Jordi Savall/Pedro Etevan). Alia Vox CD AVSA 9907. From James Manheim: This 2014 release is a sequel, 20 years on, to one of Jordi Savall's most successful earlier albums, 1994's La Lira d'Espéria. The "lyre" of the title is the set of descendants of Greek stringed instruments in use during the Spanish golden age: the vielle, its Islamic counterpart the rebab, and the rarer rebel morisco, all three of which are played by Savall on this recording. (Hesperia was the Greek name for the Iberian peninsula, and for Italy as well.) The difference between this second volume and the first one is that the present release focuses on the music of the Galicia region, ruled in the 13th century by Alfonso X, known as El Sabio, the Wise. Alfonso, who appreciated both the Islamic and the Jewish scholarly traditions, was a poet and composer (or perhaps compiler) who left more than 400 songs known as the Cantigas de Santa María. There is considerable iconographic evidence that these were sometimes performed as instrumental melodies, and that's what Savall does here, weaving the cantigas together with Galician folk materials that survive in oral tradition. Savall is a musician known for imaginative reconstruction of lost repertories, but here he justifies his musical choices in some detail. What gives his performances of this material its haunting quality is the presence of the heavily bearded percussionist Pedro Estevan, one of the most fascinating of Savall's roster of contributors over the years. This music may seem sparse, but it has proven both historically interesting and commercially successful; it's absorbing and stands up to repeated hearings, revealing something of the complex society from which it sprang. Highly recommended. II. 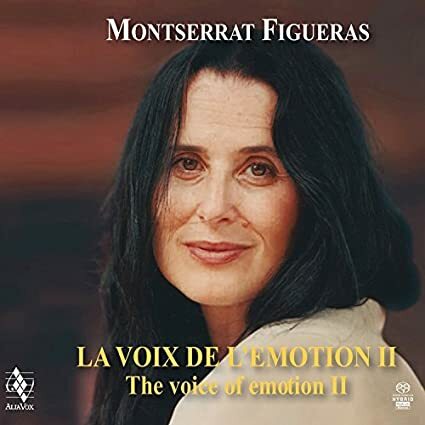 Montserrat Figueras: The Voice of Emotion II. Alia Vox CD AVDVD 9904. Soprano Montserrat Figueras, a genuine and beloved superstar of the early music world, passed away on November 23rd, 2011. A few months later, Jordi Savall released a tribute album to his wife entitled The Voice of Emotion. This specially-priced compilation, which featured gems from the Naive and Alia Vox catalogs, was a huge success. Alia Vox now presents a second volume, which further explores the legacy of this great artist. Fourteen tracks of audio are combined with 55-minute DVD portrait (offered on two DVDs to allow for multi-language subtitles). Housed in a beautiful CD-book containing rich illustrations and scholarly notes, this set is a both a superb introduction to Figueras's talents to those unfamiliar with her and a perfect way for fans to rediscover and remember this legendary musician. 5. Alma buscarte has en mi TERESA DE JÉSUS / ANON. III. 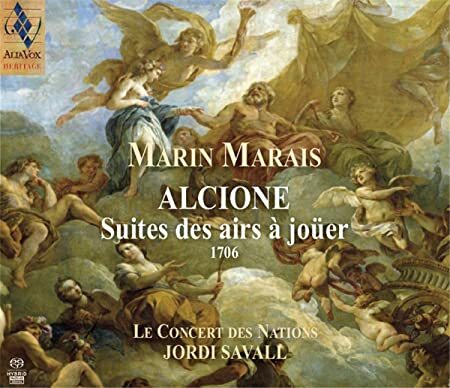 Marin Marias: ALCIONE, Suites des Airs à jouer 1706 (Le Concert des Nations/Jordi Savall). Alia Vox CD AVSA 9903. On 18 February 1706, the opera (or tragédie en musique), Alcyone was given its first performance at the Palais Royal in Paris. The public response was immediately enthusiastic. It was to be Marin Marais’s greatest triumph. The composer, aged fifty, was at the height of his career. He had just replaced André Campra as “conducteur” at the Paris Opera, beating time for the numerous performers who were called upon to play in the pit or appear on stage. Before honouring his new position with the performance of Alcyone, the former pupil of Sainte-Colombe had made a name for himself as a bass viol player quite early on, in 1676. His talents as an instrumentalist earned him a place in the Opera orchestra and in the Musique du Roi, and he took part in the grandiose performances of the operas of Lully, whose protégé he became. He soon began to compose not only numerous pieces for the bass viol, but also operas: an Idylle dramatique, performed in concert in the apartments of Versailles in 1686; then, in 1693, Alcide, written in collaboration with the son of the great Lully, Louis; Ariane et Bacchus in 1696; Alcyone, ten years later; and Sémélé, whose failure in 1709 led him to give up composing for the stage. He subsequently made a number of alterations to Alcyone for its revival in 1719. After his death in 1728, the opera was restaged in 1730, 1741, 1756, 1757 and 1771, which shows how popular the work was. Alcyone, like Alcide, Ariane et Bacchus and Sémélé, follows in the tradition of Lully. It is a tragédie en musique in five acts and a prologue. The librettist, Antoine Houdar de la Motte, took his inspiration from Ovid’s Metamorphoses, on which he relies heavily for his description of several episodes, notably the moving storm scene in Act Four. After a pastoral scene, during which Apollo, accompanied by the Muses, naiads and dryads, shepherds and shepherdesses, celebrates the glory of Louis XIV, the opera proper begins. The wedding ceremony of Alcyone, daughter of Æolus, and Ceyx, King of Trachis, with whom she is in love, is first of all disrupted by the Furies, who ascend from Hades to the sound of thunder. Then, at the entrance to the cave where Phorbas the magician works his evil spells, the latter announces to the hapless husband that he will lose the woman he loves and he himself will perish, unless he repairs to Claros to consult with Apollo. Following this advice, which is in fact intended to “hasten the misfortunes he hopes to avoid”, the king embarks at the port of Trachis, which provides an excuse for a picturesque divertissement with a sailors’ dance. After Ceyx’s departure, Alcyone faints with sorrow. Disconsolate, she offers up a sacrifice in the Temple of Juno, in the hope of obtaining heavenly assistance. It is then that Sleep appears, “on a bed of poppies, surrounded by mists”. Through the agency of Dreams, he shows Alcyone “a stormy sea, where a ship is sinking”. From amongst the sailors, Morpheus appears in the shape of Ceyx and addresses a moving appeal to Alcyone before being swallowed up by the waves. This nightmare wakens her with a jolt. In desperation, she tries to kill herself, but Phosphorus, her husband’s father, descends in his star and announces to her that his son is to return. In the dawn light, she sees Ceyx, whom she thought was lost for ever, lying on the turf, apparently lifeless. Believing him dead, she stabs herself with his sword. But Neptune immediately rises out of the sea and brings the lovers back to life, entrusting them with the task of calming the waves. This happy outcome gives rise to a sumptuous divertissement performed by the gods of the sea. As in the other tragedies en musique of the time, the purely orchestral parts play an important role in Alcyone. Himself an instrumentalist, Marais paid particular attention to the instruments, bringing them to a hitherto unequalled refinement, as can be seen from the pieces chosen for this recording. The dances also follow the Lullian tradition: gigues, sarabandes, passepieds, minuets. One of the minuets is intended to serve as an interlude – in other words, played while the sets are being changed in full view of the audience. In the chaconne at the end of the last act, Marais shows himself to be by no means inferior to his illustrious precursor, creating ingenious variations both in the rhythm and the melody. These episodes, in five or three parts, are sometimes wonderfully serene in atmosphere, sometimes gently melancholy, and sometimes astonishingly poetical. In the march for the shepherds and shepherdesses in the prologue, the composer further enriches Lully’s models, heralding the masterpieces of Jean-Philippe Rameau. While he has recourse to the trio of reed instruments which had become traditional, oboes and bassoons to bring out the pastoral character of this entrance, he also imitates the musette with delightful dissonances on a tonic pedal and a delicate transition from minor to major, during which the orchestra takes on a fragile, hesitant quality. The work truly foreshadows the world of the fetes galantes of the Regency and the reign of Louis XV. In order to pander to the tastes of his contemporaries, Marais not only gives in to the fashion for bergerie (pastoral subjects), but he also slips catchy tunes into several of his dances, which are then repeated immediately afterwards by one of the soloists and usually by the chorus. Instances of this are to be found in the prologue, with two minuets entrusted to shepherds; in the first act, with the sarabande for the Æolians and Ceyx’s courtiers, and, finally, in the third act, with the famous sailors’ march, which was the subject of several instrumental transcriptions before crossing the Channel and becoming widely known in Britain in the19th century in an English version: an old tune with new words. These tunes are so catchy, in fact, that we cannot help wondering if they were already widespread in Marais’s day, and were borrowed from a popular repertory when the opera was created. Other exclusively orchestral pieces, this time unrelated to the ballet, are much more complex. The prelude and ritornello at the beginning of the third and final acts, respectively, are quite remarkable. The former serves as an introduction to one of the finest arias in the score: Peleus’s Oh Mer, dont le calme infidèle (“O sea, whose inconstant calm”). Through the use of long note values and dissonances, Marais manages to depict the feelings of sadness mingled with serenity inspired by the words. The ritornello is perhaps even more surprising because of the impression of intimacy that it creates. Written as a trio, as if conceived as chamber music, this meditative, very inward-looking piece comprises a single theme developed in the three parts, its melodic line seeming to express Alcyone’s helplessness and solitude. The descriptive “symphonies” composed for Alcyone are in striking contrast to this ritornello: they harness all the means the orchestra of the time had at its disposal in order to impress by their forcefulness. The Symphonie du Sommeil (symphony of Sleep) in Act IV is inspired by the one in Lully’s Atys: the flutes still play at a third and are shown to great advantage, as is the bass, which introduces an expressive movement, softly accompanied by the other strings. Despite the use of triple time, Marais moves away from the model bequeathed by his predecessor: unlike Atys, his composition is no longer reminiscent of the Italian “sommeils” of Rossi or Cavalli, but takes on a very French elegance, thanks to the melodic pattern of the upper parts, which is more polished and delicately enhanced with ornamentations. Whilst carrying on the great traditions of Lully, Alcyone thus paved the way for other creations in the privileged field of French opera.